The power of habit helps illuminate the importance of establishing a daily routine or rhythm in our lives. A daily rhythm or routine is one long daily habit; once established it can keep you on track and help you and your whole family live a balanced and productive life. Learn how to have a good daily routine with the power of habit! Make the choice to turn your routines into daily habits to create your day exactly the way you want it to be. Use the power of rhythms and routines to make positive habits a way of life! The habit of a daily routine or rhythm will provide a framework for your day, support your whole family’s ability to stay on task and offer the freedom to live the life that dreams are made of. When everyday tasks become habits they no longer require much energy to complete. This can both assist you in getting things done and open the space to begin other projects you never thought you would have time for. When your daily rhythm contains the space for you to get things done, accomplishing goals becomes a way of life. 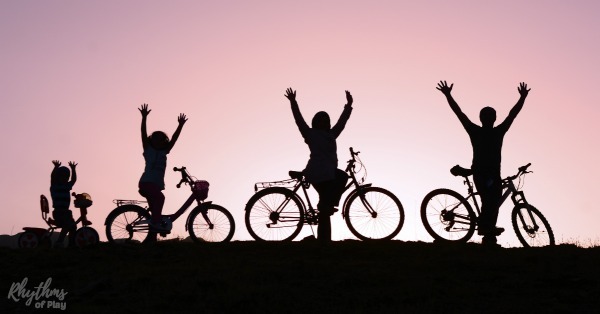 Positive habits, such as established household rhythms, work to save energy and brain power for the times you need it. When you establish and follow a daily rhythm it will support your focus and free up your mind to concentrating on higher level activities when you need to. In other words, getting through your day-to-day tasks will no longer draw much energy from your reserves. This leaves you with strength to create new positive habits, work on projects, or have more freedom to do the things you LOVE! Create a rhythm for your day in order to make the time to do the things you’ve always wanted to do. Once you begin following a daily routine or rhythm, an amazing amount of free time will become available to you. The daily habit of your routine will also free you from the overwhelm of trying to figure out what to do each day, and leave you with more free time than you ever thought possible. No matter what your feelings may be about schedules, having a structure in place is a necessity when it comes to staying on task and getting things done. In my experience, following a daily routine or rhythm creates a natural flow to the day. When we follow a rhythm this follows that, but this and that doesn’t necessarily happen at the exact time each day. When I don’t have any structure in my life I feel lost and completely overwhelmed from the minute I wake up in the morning, to the second I fall asleep at night. Establishing a daily rhythm has allowed me to establish a string of positive habits that lead me through my day. Where there was once chaos in my life, there is now an orderly sense of freedom in place, even when life gets crazy! Establishing household rhythms brings our lives back into balance in two primary ways. First, we are surrounded by the rhythms of nature; the rising and setting of the sun, the phases of the moon, and the changing of the seasons. Our bodies are also permeated with the rhythm of our beating hearts and the rhythmic quality of our breath. Our modern lives with all its modern technologies have led us away from these natural rhythms. Following a daily rhythm or routine creates harmony and balance where there has been discord in our lives. Establish a daily rhythm to automatically build rest and self-nurturing into your day. As mentioned above, following a daily rhythm requires that periods of activity are followed by periods of rest. Follow a daily rhythm in order to assure that this need is met so you do not burn out and become overwhelmed. A daily rhythm has periods of expansion where we relate to others, and periods of contraction where we relate to ourselves. You can not give another what you don’t first give yourself. Create the space in your daily routine to rest and rejuvenate each and every day. Make rhythm a habit to make everyone in your home less reactive and more proactive. When positive daily habits and household routines are in place, I find myself much better able to remain calm within the rising storm. When I’m not following a rhythm, I cannot do anything but react to the life that is happening to me. Overwhelm and chaos rules my world as I struggle to deal with daily life. I have found that the habit of a daily routine can hold us steady even during the most challenging times in our lives. The positive daily habit of following these household routines and rhythms has provided my family with the support that we need to get through our every day, even when it’s one of THOSE days! Following a daily routine or rhythm in the home is a built-in form of discipline. Sudden changes and a disorganized flow to the day cause infants and young children to erupt at the slightest provocation. 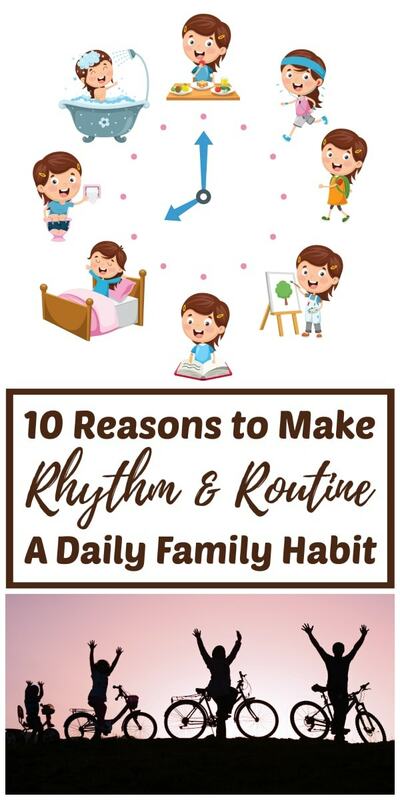 Rhythm and routine both guides the child’s life through the creation of positive daily habits and helps avoid arguments and problems. This is especially true for children that have difficulty with transitioning from one activity to the next. For these children [like mine] rhythm is both a miracle and a blessing. I don’t know if my child would go to bed if it weren’t for her bedtime routine. We have been following the same rhythm following dinner leading to bed since she was an infant, long before we knew how much trouble she was going to have with transitions. This is the rhythm that carries her to bed without incident [most of the time] every night of her life. It is all she knows, and that’s why it works so well. Regularity should prevail in as many of the child’s activities as possible. Rhythm and routine in the home is the key to establishing good habits for life. Related: How to Change Your Life with the Power of Habit. Establishing positive daily habits and a rhythmical home life will nourish both you and your family. Following a daily rhythm is especially important for infants and young children. Children cannot handle it when a frenzy of activity surrounds them, while they thrive when strong routines are in place. When home life is chaotic and disorganized children are unable to make sense of things. This causes all sorts of related issues–tantrums, emotional problems, sleep issues, and a general lack of cooperation. 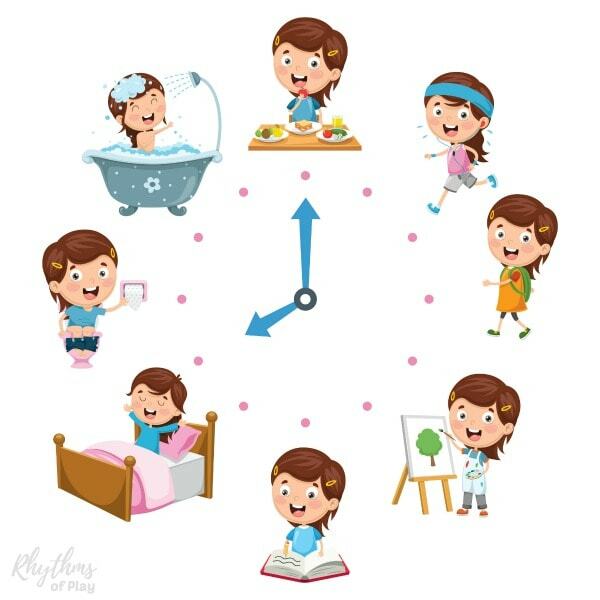 Strong Household rhythms and routines can help children know what comes next in their day. Knowing what comes next can help with daily transitions because most children excel within the familiar. When you make a daily routine your habit, where this always follows that, children begin to know and understand what will come next and will be ready for the transition from this to that. Rhythm and routine in the home can also help children become more independent because they know what to expect. When they know what to expect, they can help around the house. When a strong daily routine is in place, children will be better at getting their homework done, assisting with housework, and meeting other obligations. The positive daily habit of a strong routine in the home can influence our children for the rest of their lives! Establishing a daily rhythm will easily allow you to create new positive habits in your life. When you establish a daily routine, the opportunity to add new positive habits to your day will surface. The best way to do this is to add new positive habits one by so they take hold and become a daily habit and thus a part of your daily routine. Check out how to use the power of habit to change your life for more information. Having a daily habit of a strong daily routine in place also lessens the ability of negative habits to resurface. The habits and routines that are a part of your daily rhythm will become stronger and stronger over time. If your daily habits become strong, you will have no room for negative habits to move in and take over. Daily household routines and rhythms can include everything you and your family need to run your home. This means that all personal, business and household chores need to have a regular space within the household rhythm. A daily rhythm or routine is one long daily habit. Once established it can keep you on track and help you live a more balanced and productive life. The habit of a strong daily rhythm can thus allow you to find freedom within the structure of your every day! Create a daily routine or rhythm and make it a habit to transform your home life and live the life you have always dreamed of! For more information see How to Plan Your Daily Rhythm. 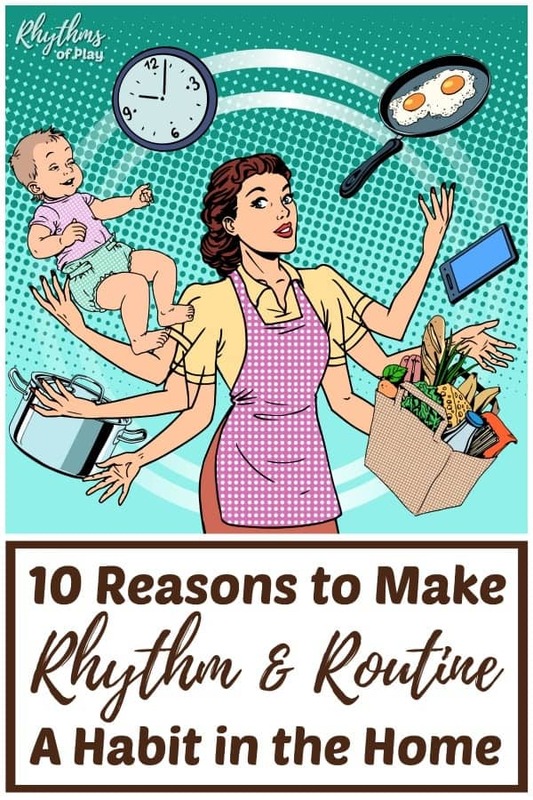 I used some of my favorite parenting books about the power of routine and rhythm in the home to help write this article. You may also like This collection of positive parenting books for raising children from zero to five. Beyond the Rainbow Bridge: Nurturing Our Children from Birth to Seven by Barbara J. Patterson and Pamela Bradley. « Fall Books for Kids: Autumn Stories Children LOVE!